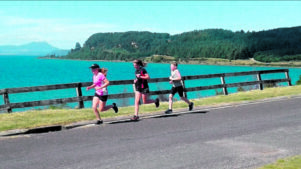 It’s not every day two teenage girls decide they want to spend their weekend running from Napier to Lake Ferry. But for the Higinbottom sisters, 15-year-old Georgia and 13-year-old Millie, running 300km in three days seemed like the perfect way to pay tribute to their late Nana Marg, who suffered from Alzheimers. “We researched about it and there’s no known cure,” Georgia said. The pair are organising a team of 20 runners who are passionate about the cause to join them on the run in a bid to raise $20,000 for Alzheimers research. So far they have managed to raise over $1200 and have secured sponsorship from Provincial insurance brokers in Masterton for shirts to wear during the event. Insurance adviser Kris Towgood, said he knew the family well and it made sense to sponsor them, saying the girls’ motivation was “fantastic”. The sisters are driven by their love for their Nana who they described as a “very caring, selfless person” who was robbed of her memory by the disease. “When it gets hard, in the back of my head I think about why I’m doing this and it motivates me to keep going,” Georgia said. Georgia and Millie have organised the whole event themselves, with help from their cousin Ben Higinbottom, who aptly named the event ‘jogyourmemory’. They’ve even managed to rope in their 11-year-old brother Jack, who is fortunately a keen cross-country runner. They have organised the whole event themselves, with only a little intervention from parents Mike and Jodie. “There was one stage where they wanted to run the whole length of New Zealand so there was a bit of parental guidance,” Mike said. Mike said he and his wife were “extremely proud” of what their daughters were trying to achieve. “It’s one thing to come up with an idea but to see it through is a big step,” Mike said. The event will take place in mid-April, starting in Napier and ending at Lake Ferry. The 20 runners will each run five 5km stints a day with every runner covering 75km all up along the 300km course. Anyone wishing to donate to the cause can do so online at www.givealittle.co.nz where the search word is, jogyourmemory. The sisters are also busy organising a quiz night and auction at the Tinui Café and Bar in March and welcome any donated products.